Sometime in 2003 we decided to take another trip to Costa Rica. This time we planned to get a little closer to the real country so I developed an itinerary that had us staying in B & B s and although we were still doing tourist type activities I hoped we would learn a little more about living in Costa Rica. 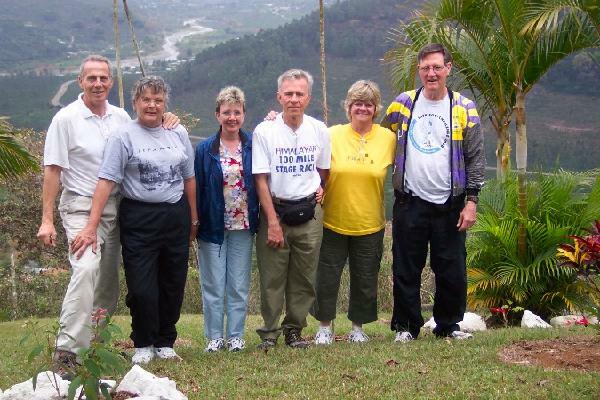 As our plans developed we attracted interest from some of our friends and before long Jay and Betty Norman and Chuck and Pam Chandonia rounded out our little troupe and thus the Costa Rica Six was born. If you have never planned your own trip it is pretty time consuming and entails quite a bit of research. To help us I used what was then called “The Travel Store,” now I believe it is called “123 Costa Rica Travel.” Carolina Biamonte was most helpful and took care of all the details with local phone calls. We communicated mostly by e-mail. Because we only had eight days we decided to confine our tour to the Central Valley. This was also the area of choice when it came to living in Costa Rica and additionally there were several places for sight-seeing and tourist related activities. Tightening down our area of travel allowed us to stay in one B & B for more than one night and we didn’t wind up spending a lot of our time driving. Using “The Travel Agency” had other advantages. When I picked a B & B Carolina would check it out and make sure it was suitable and then she went ahead and made our reservations. She also reserved two cars for us and when we were all done we wire transferred the entire amount for lodging and car rental to her and she issued us travel vouchers for each place we stayed. This worked out great and we saved 5% by not using credit cards. DO NOT, however, send Money Orders. I misunderstood and initially sent Money Orders. They were not accepted and I sweated for a few days until I got them back and was able to cash them in. Wire transfer is faster and much more secure. Each couple made and paid for their own airplane reservations. When we got all done it cost the six of us $3200.00 for lodging, and transportation. That included the river rafting, canopy tour and the San Jose city tour. It did not include food except for the breakfasts at the B & B s or entry to any sightseeing activities. We paid for these as we went and that gave us some added flexibility to tailor events to each couple’s desires. As it turned out, except for Pam not being able to do the river rafting because of her bad back, we all did pretty much the same things. It wound up being a pretty congenial group, which is not surprising because we were friends before the trip. Each couple also took care of their own airfare, but figuring an average of $500.00 per person airfare, that made our total expense around $1000.00 per person for an eight day trip. So on February 28, 2004 the “Costa Rica Six” left for Costa Rica. SIGHT-SEEING-We toured Grecia, went to the Zoo Ave in La Garita and then spent a day at the La Paz Waterfall and the Poas Volcano. We went to Poas in the afternoon and that was a mistake as it was socked in with clouds and we didn’t even drive to the top. If you are going to Poas go early in the morning. Even then it is cloudy much of the time. When we left the Posada Mimosa we drove through Sarchi, Zarcero and then continued to Cuidad Quesada where we stayed at the “Termales Del Bosque.” We spent time in the thermal baths and took the canopy tour there. It was not as big and thrilling as some others but for our first time it was exciting enough. They also have a great Tilapia dinner at their restaurant. From there we went to Hacienda Pozo Azul and took a Class II/III white water rafting excursion. It was great and they even took a DVD of our trip, pretty exciting. They also have a much bigger canopy tour that I am anxious to try some time. Pozo Azul is located on the Caribbean side near La Virgen. After we left the Pozo Azul we drove along the Caribbean side of the mountains and then went south through the Braulio Carrulio national forest, around San Jose and then East to the Orosi Valley. Driving around San Jose was an experience, and had it not been for Chuck’s navigation we would still be circling the round-a-bouts. The Sanchiri Lodge lined us up with Jose Jimenez who worked for ½ Pound Tours and the six of us toured the Orosi Valley and drove up to the Irazu Volcano. It was a great tour and I recommend it highly. We visited the magnificent church in Cartago, the Lancaster Gardens, The House of the Dreamer, a sugar mill and stopped at many other local points of interest. We ended our trip at the Costa Verde Inn in Escazu and visited The Monastery, a beautiful place on top of the mountain that has been converted into a restaurant, and then wrapped it up with a Tour of San Jose. FOOD-We ate mostly local fare at roadside Sodas (the name for locally owned and operated little restaurants) and the food was generally very good with plenty of fresh fruit and vegetables. In fact our biggest disappointment came at The Monastery, where I thought the food was over priced and not very good. Some liked it though. THE PEOPLE-We were treated very well every where we went. The Costa Ricans went out of their way to be helpful and the canopy tour and the rafting were very safe and comfortable. The maids would wash and dry our clothes when we need them and the B & B s were really well run, clean and comfortable. THE GEOGRAPHY-Costa Rica is very mountainous. I would not attempt to go there if I was in very poor shape or had a handicap. There are few handicap-friendly places and the only flat places are the futbol fields. The sidewalks are rough and uneven and the roads range from pretty good to very bad. If you are not adventuresome you won’t make it in Costa Rica or should stick to organized tours. There are no street signs and we got lost several times. Thank goodness Chuck could usually figure out how to get us back on track. Because it is so mountainous and a nation of many small farms the views are spectacular with each corner bringing more oohs and aahs. THE WEATHER-March is in the Verano or dry season and the weather is simply perfect. Daytime highs are in the 70’s and nighttime lows in the high 60’s-low 70’s. You do have to be careful as Costa Rica lies around 9.5 degrees above the equator and the sun is very bright and hot and will burn you in few minutes. NEGATIVES-There were really few problems during this trip. One of our bags didn’t make it, but it was delivered to Grecia the next day. Although everyone was warned not to leave anything unattended, one tote bag disappeared and we had a close call with a backpack although we did find it. The rental cars held up well and we had no accidents or mechanical problems. The beds were a little hard in some of the rooms and Costa Rica is not a quiet country. So if birds, roosters and barking dogs bother you, bring a good set of ear plugs. I think everyone had a good time and we took many, many pictures. WHAT WOULD I CHANGE-I would not take the City Tour on a big bus again. We spent 2 hours going from hotel to hotel picking up and dropping off passengers. I would arrange for a private tour similar to the one we had in the Orosi Valley. I should have checked this out more carefully. Other than that I think we got as much out of our 8 days as could be expected. OUR RAINBOW GETS A LITTLE CLOSER-While we were in Grecia we visited Randy and Rhonda Berg. They have built a gorgeous home on about two acres of a coffee farm and were also in the real estate business. Their home had been built for a reasonable sum and if everything worked out it would just fit our budget. Even though we still considered ourselves tourists, we had gained a lot of knowledge about Costa Rica and were gathering a lot of information on what it would take to live there. This trip convinced us to go to the next step and visit again. This time we would not do any sightseeing and would concentrate on examining places to live.